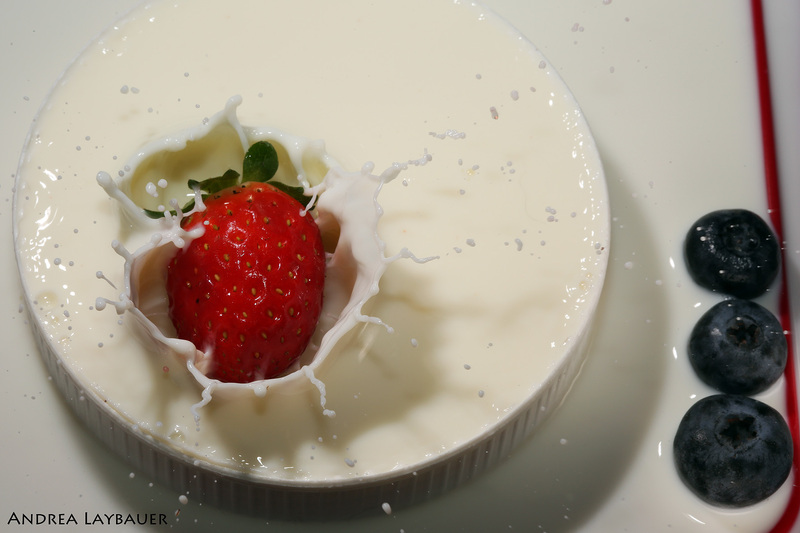 The classic strawberry photo falling in the milk! And only! It was made in the kitchen sink. Degree of difficulty 1, because the only challenge is to synchronize the fall of the strawberry with the click. For me it was okay to count "3, 2, 1 and now" and click right after releasing the strawberry. In a few attempts you can hit one. Camera on the tripod (as usual) and use the kitchen sink as a place because it is easy to clean afterwards. The flash will be in the camera. I used a second flash that shoots through photocell but you can do without it. Manual focus (as always), camera at 1/125 speed only to give the sincronism, f.22 (as always) and flash at 1/64 of power (as always). Mount a container overflowing with milk and think about a composition. In this case, I used the white lid and down a red square container because I wanted that red thread well crooked to break the symmetry. I also put the blueberries because I thought it would be good. Focus beforehand exactly where you will throw the strawberry. I used the clothespins to focus. Start! This photo is made in trial and error. You need to click exactly the moment the strawberry falls into the milk. Begin by doing both at the same time. If on record the strawberry has not yet fallen, throw the strawberry a little earlier. If you have already fallen, play a little later. Simple! A remote control can help. I used mine. 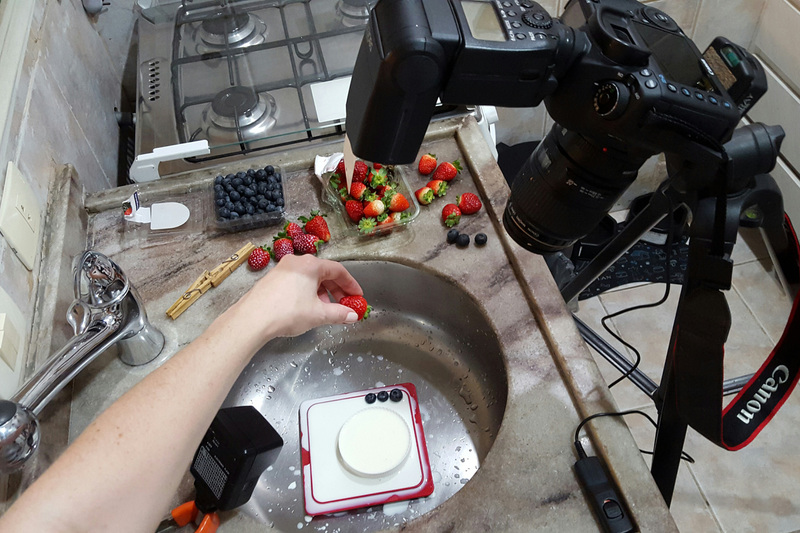 You need to dry the strawberry after each photo and also watch for dripping milk that is not part of the composition. That's what makes the photo professional. See in the "photos that did not worked" a moment where the third blueberry is filled with milk. You have to dry it, for it is these details that make the difference.